Well, looks like there is going to be a bit of a delay before I get the rest of my Alaska pictures up. I have apparently gotten a head cold. Based on when symptoms started, I'm blaming the canned, recycled air on the flight back home. So for now, I'm sucking down the tea (and Dan's going to make me chicken soup tonight!) and trying not to do anything for which I need full mental capacity. I did manage to get a handful more of pictures edited and posted, so here's another little sample. And, more exciting for me than anyone reading this (unless you are a fellow yarn fan), I have some pictures of my souvenir yarns! Okay, the first two aren't all that special. Well, they have 10% camel (I just can't say no to unusual fibers), but they aren't specifically Alaskan. 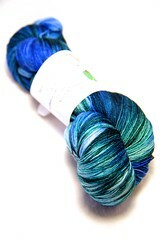 The third one isn't Alaskan, either (in fact, it is German), but dude, self-striping sock yarn inspired by a Van Gogh painting. I couldn't say no! 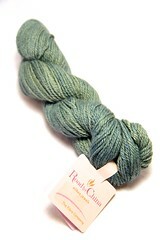 The fourth one, the lovely blue and green, is Alaskan - it's hand dyed by a Juneau-based dyer. Neat, huh? And the last one... oh, the last one. 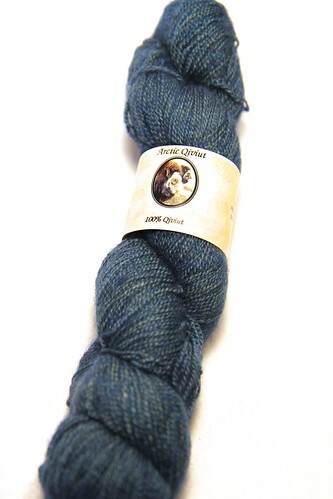 That's my stereotypical "a knitter goes to Alaska" yarn. It's 100% qiviut, also known as muskok wool. Don't even ask what it cost. A ridiculous amount. 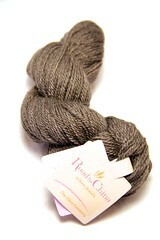 In fact, the other four yarns I got cost less than this one. Like, half. But I had to get it. It's so soft and warm - Alaskan and an unusual fiber. I love it! And there is a dash of an Alaska update! Hopefully my head cold will go away quickly and I'll get the rest of the pictures up soon (by Monday is the goal). Fingers also crossed that this post makes sense. I've caught several places where I used a totally random word in place of one that would actually made sense. Sorry if any head-cold-related nonsense remains! In my twenties, I dated a man that lived in Juneau. Well you answered my question, I read your last post and was going to ask if you purchased any quivet! Let me know how you like it? I've been thinking of purchasing some and making a hat for my father. Yep it can be expensive but my dad is worth it so I'd knit something out of it for him and he's very knitworthy. My dad likes puttering around outside in during the cold months. I really look forward to the qiviut - it's super-soft and warm. I hope it knits up (and wears) well! I will definitely update once I pick the perfect pattern for it! As for the Opal, honestly, I had never heard of it but apparently it's a pretty good brand so yay! 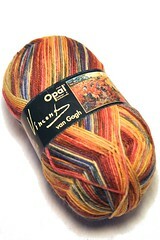 I'm just a Van Gogh fan - though they didn't have any skeins based on his Garden of Irises (my fav painting).